From skretch after activation user must've to add Company name, select state where it located and GST Number of company. Access add, edit and print Invoices, Customers and Items directly from dashboard. Add different customers and manage their informations like GST No. PAN No. Address, Email, etc. Add different items with their rates, HSN Code and GST Percentages to use them into making different invoices. Configure Invoice by as per work need like if invoice contains terms & conditions then enable it and save it. 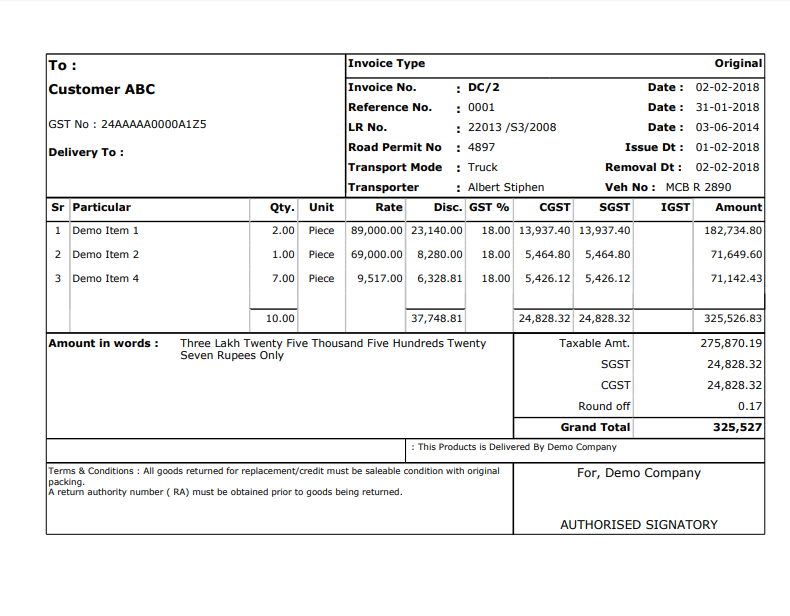 Make an Invoice by adding customer details, Delivery/Shipping Address, items and other notes. Print created invoice by different format. GST Invoice Printing is a feature rich invoice printing software tool for the small business & medium sized company. You can choose invoice formats for print, efficiently and accurately, by using what-you-see-is-what-you-get. It handles multiple levels of taxation very easily with inbuilt expression decoder. GST Invoice, VAT or CST Invoice, Jobwork Bill etcâ€¦ can be configured and used. 2018 ? All Rights Reserved.